Kill the tribbles and save the whales. Trek IV did it well (Captain, there be whales here! Where’s me harpoons? Trek plot-lines since the tribbles took over the Enterprise. edition). 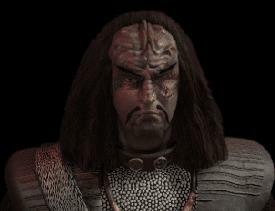 Rebel Klingon factions are vying for the position of ultimate cheeseball. is essentially warring starfleets in space. Z-axis, control, camera, and combat dynamics are all based on a 2D grid in space. planets, make the big empty into a vibrant RTS battlefield. 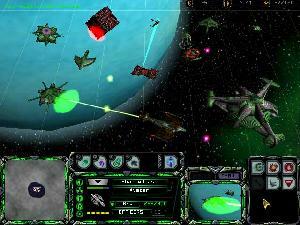 Most missions involve building up a base, amassing a fleet and going to war. for a plain vanilla Sovereign. Crew is the great innovation in Armada. Each ship and station has crew on board. Damaged ships lose crew and ship performance decreases as crew is lost. When all are gone, the ship becomes a derelict. Other ships or stations can beam crew onto a derelict ship or any ship whose shields are down, and if crew is beamed onto a hostile, populated ship, the crew battle it out until control is taken. 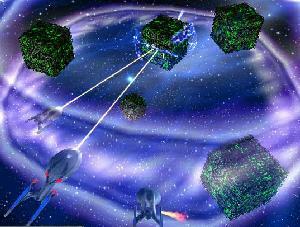 The Borg, with their assimilation technology, have an easier time taking enemy ships and stations. Dilithium (the stuff that powers warp drives and apparently can be mined from conveniently placed, blueish moons) makes up the other resource. for more after you tire of deeper fare. battlefield with fireworks displays of phasers, disrupters and photon torpedoes. A small window in the on-screen interface shows battles from cinematic angles. look like the opening battle from First Contact. One especially nice, subtle effect is that during construction of stations and ships, you see the construction pods building them polygon by polygon. Armada‘s mix of 2D mechanics and 3D graphics is one of the best compromises of dimensions in RTS games today. The sound is all true to the Star Trek movies and series and several of the actors are on board for voice acting duties. Music tends to be slightly tinny and repetitive, but overall Armada is a good audio/visual experience. The main failings of Armada, aside from the lack of depth, are stability and compatibility. The game is prone to crash to the desktop roughly every 30 minutes, which makes the player somewhat paranoid about saving. Armada also has compatibility problems with a variety of graphics card chipsets such as the Nvidia TNT which, at press time, still have not been resolved. There is no denying that Armada is the rare Star Trek game which gets most of it right. Star Trek realism is sacrificed successfully for well-balanced RTS gameplay and the result is a straightforward, enjoyable game that should appeal to everyone except strategy grognards and rabid Trekkies. But hell, who needs those people anyway? All energy to weapons, red alert. A fun Star Trek game!